If H.L. Mencken is not the greatest American writer, he is certainly its most cruel. With a few strokes of the pen, this one-man wrecking crew was able to annihilate ideas, beliefs and people. He had little love for misconceptions that paraded as truth. He was at his best when he was demolishing strongly held beliefs that wilt under the light of reason. Mencken had a special place in his dark heart for mauling politicians who he believed to be demagogues. 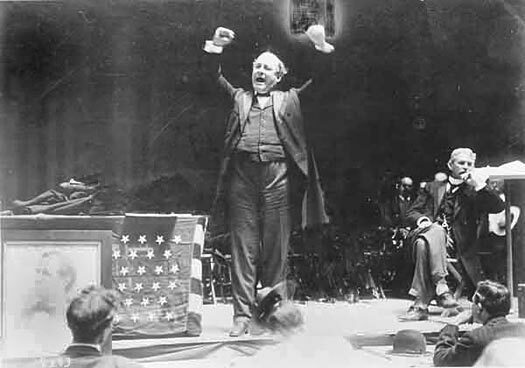 He seemed to particularly enjoy berating William Jennings Bryan. Bryan, the renowned Congressman, three time Presidential candidate and Secretary of State under Woodrow Wilson, was best known for his vehement attack on the teaching of evolution in public schools during the Scopes Monkey Trial. The trial was an embarrassing end to Bryan’s career and he died soon after. Upon Bryan’s death, Mencken wrote a truly intriguing column. It was one of the most vicious, malevolent pieces of writing ever published and it was an OBITUARY. Usually, death is something that would make even the most cynical of writers call off the dogs, but not Mencken. He proceeded to desecrate the corpse of Bryan with a stream of invective that is legendary for it’s sheer mercilessness. Upon reading the piece, many readers are left with two feelings. The first is that Mencken’s writing is incredible. His epic prose shows the pure buffoonery exhibited by Bryan in a way that is both frightening and hysterical. The second is a feeling of disgust. Should Mencken really have been attacking a dead man in this way? Obituaries are often read by friends and family who are mourning the passing of someone dear to them. A reader could easily walk away with the feeling that the world is better without Bryan and that his passing is something to be reveled in. Mencken was stating what he believed to be true. He was being honest in a way that is almost brave. He is not only attacking Bryan, but also the social custom of allowing the recently dead to be exonerated for the way they lived their lives. However, his words could easily have led to untold suffering and misery. The question of what sort of limit should be set on the amount of pernicious rage that a writer should exhibit is not an easy one to answer. Sometimes it feels like saying the worst possible thing is the correct action. Language can be a weapon that teaches ignorant people to keep their mouths shut. There is a certain beauty in that. There is also a liberating feeling in calling the thing what it is with no restraint. This sort of rage can also be a weapon that causes irreparable harm. We are all humans who, at times, can say and do highly unenlightened things. Should we be ruthlessly punished for each mistake we make? Should we be tormented for living ridiculous lives based on senseless beliefs? Will this sort of brutality teach us to be better people? I’m not sure, but I think the Mencken piece allows us to ask this question and for that reason it is a highly valuable thing. Plus, it’s really, really funny. It was plain to everyone, when Bryan came to Dayton, that his great days were behind him — that he was now definitely an old man, and headed at last for silence. There was a vague, unpleasant manginess about his appearance; he somehow seemed dirty, though a close glance showed him carefully shaved, and clad in immaculate linen. All the hair was gone from the dome of his head, and it had begun to fall out, too, behind his ears, like that of the late Samuel Gompers. The old resonance had departed from his voice: what was once a bugle blast had become reedy and quavering. Who knows that, like Demosthenes, he had a lisp? In his prime, under the magic of his eloquence, no one noticed it. But when he spoke at Dayton it was always audible. When I first encountered him, on the sidewalk in front of the Hicks brothers law office, the trial was yet to begin, and so he was still expansive and amiable. I had printed in the Nation, a week or so before, an article arguing that the anti-evolution law, whatever its unwisdom, was at least constitutional — that policing school teachers was certainly not putting down free speech. The old boy professed to be delighted with the argument, and gave the gaping bystanders to understand that I was a talented publicist. In turn I admired the curious shirt he wore — sleeveless and with the neck cut very low. We parted in the manner of two Spanish ambassadors. II What was behind that consuming hatred? At first I thought that it was mere evangelical passion. Evangelical Christianity, as everyone knows, is founded upon hate, as the Christianity of Christ was founded upon love. But even evangelical Christians occasionally loose their belts and belch amicably; I have known some who, off duty, were very benignant. In that very courtroom, indeed, were some of them — for example, old Ben McKenzie, Nestor of the Dayton bar, who sat beside Bryan. Ben was full of good humor. He made jokes with Darrow. But Bryan only glared. One day it dawned on me that Bryan, after all, was an evangelical Christian only by sort of afterthought — that his career in this world, and the glories thereof, had actually come to an end before he ever began whooping for Genesis. So I came to this conclusion: that what really moved him was a lust for revenge. The men of the cities had destroyed him and made a mock of him; now he would lead the yokels against them. Various facts clicked into the theory, and I hold it still. The hatred in the old man’s burning eyes was not for the enemies of God; it was for the enemies of Bryan. Thus he fought his last fight, eager only for blood. It quickly became frenzied and preposterous, and after that pathetic. All sense departed from him. He bit right and left, like a dog with rabies. He descended to demagogy so dreadful that his very associates blushed. His one yearning was to keep his yokels heated up — to lead his forlorn mob against the foe. That foe, alas, refused to be alarmed. It insisted upon seeing the battle as a comedy. Even Darrow, who knew better, occasionally yielded to the prevailing spirit. Finally, he lured poor Bryan into a folly almost incredible. I allude to his astounding argument against the notion that man is a mammal. I am glad I heard it, for otherwise I’d never believe it. There stood the man who had been thrice a candidate for the Presidency of the Republic — and once, I believe, elected — there he stood in the glare of the world, uttering stuff that a boy of eight would laugh at! The artful Darrow led him on: he repeated it, ranted for it, bellowed it in his cracked voice. A tragedy, indeed! He came into life a hero, a Galahad, in bright and shining armor. Now he was passing out a pathetic fool. III Worse, I believe that he somehow sensed the fact — that he realized his personal failure, whatever the success of the grotesque cause he spoke for. I had left Dayton before Darrow’s cross-examination brought him to his final absurdity, but I heard his long speech against the admission of expert testimony, and I saw how it fell flat and how Bryan himself was conscious of the fact. When he sat down he was done for, and he knew it. The old magic had failed to work; there was applause but there was no exultant shouts. When, half an hour later, Dudley Field Malone delivered his terrific philippic, the very yokels gave him five times the clapper-clawing that they had given to Bryan. This combat was the old leader’s last, and it symbolized in more than one way his passing. Two women sat through it, the one old and crippled, the other young and in the full flush of beauty. The first was Mrs. Bryan; the second was Mrs. Malone. When Malone finished his speech the crowd stormed his wife with felicitations, and she glowed as only a woman can who has seen her man fight a hard fight and win gloriously. But no one congratulated Mrs. Bryan. She sat hunched in her chair near the judge, apparently very uneasy. I thought then that she was ill — she has been making the round of sanitariums for years, and was lately in the hands of a faith-healer — but now I think that some appalling prescience was upon her, and that she saw in Bryan’s eyes a hint of the collapse that was so near. He sank into his seat a wreck, and was presently forgotten in the blast of Malone’s titanic rhetoric. His speech had been maundering feeble and often downright idiotic. Presumably, he was speaking to a point of law, but it was quickly apparent that he knew no more law than the bailiff at the door. So he launched into mere violet garrulity. He dragged in snatches of ancient chautauqua addresses; he wandered up hill and down dale. Finally, Darrow lured him into that fabulous imbecility about man as a mammal. He sat down one of the most tragic asses in American history. IV It is the national custom to sentimentalize the dead, as it is to sentimentalize men about to be hanged. Perhaps I fall into that weakness here. The Bryan I shall remember is the Bryan of his last weeks on earth — broken, furious, and infinitely pathetic. It was impossible to meet his hatred with hatred to match it. He was winning a battle that would make him forever infamous wherever enlightened men remembered it and him. Even his old enemy, Darrow, was gentle with him at the end. That cross-examination might have been ten times as devastating. It was plain to everyone that the old Berseker Bryan was gone — that all that remained of him was a pair of glaring and horrible eyes. But what of his life? Did he accomplish any useful thing? Was he, in his day, of any dignity as a man, and of any value to his fellow-men? I doubt it. Bryan, at his best, was simply a magnificent job-seeker. The issues that he bawled about usually meant nothing to him. He was ready to abandon them whenever he could make votes by doing so, and to take up new ones at a moment’s notice. For years he evaded Prohibition as dangerous; then he embraced it as profitable. At the Democratic National Convention last year he was on both sides, and distrusted by both. In his last great battle there was only a baleful and ridiculous malignancy. If he was pathetic, he was also disgusting. This entry was posted on January 3, 2011, 8:51 AM and is filed under Existential Rambings, The Politics Of Catastrophe. You can follow any responses to this entry through RSS 2.0. You can leave a response, or trackback from your own site. My mother, a half-Jew, meet Mencken once in connection with a 1930s job interview; he insulted her too. Big deal. And when you are a public figure – e.g., Bryan – plan on being insulted/slandered both alive and dead. It goes with the job, and let’s not hear any more nonsense about “limits” on free speech. There are a great deal of limitations on speech in any free society. One is not allowed to wander into a crowded theater and yell fire, one is not allowed to verbally contract to commit a murder, one is not allowed to use certain expressions in certain times and certain places. I cannot think of an organized society that hasn’t had some limit on speech. Why is it unfair to consider whether Mencken should have the right to use this sort of malignant speech in a public forum about a dead man? At the time Mencken wrote this piece there were MANY limitations as to what could go into the Baltimore Evening Sun. These limitations were based on taste, public mores and cultural beliefs. An editor probably changed many things that writers of the time wanted to put into that newspaper. Had Mencken been a lesser known writer at the time, it is entirely possible the Sun would have never run a piece like this. Under these circumstances, why is it problematic to question whether he should have been limited in writing a story with such clear malice and coldness at its heart? Being a public figure does not necessarily mean one has signed up for limitless cruelty from the entire universe. A public figure is also a private human who deserves to be accorded a certain level of dignity. My question in this article was “How much”? Sorry your mom got criticized by Mencken, but she was insulted by quite possibly the greatest insult slinger of all time, so I guess there is something in that. Regardless, he was a jerk for doing it. I was not familiar with Mencken before your post. Interesting. I can’t help but think that if he were alive today he’d probably be a star on FOX….. He was a good deal wittier than your average angry, middle aged comb-over victim Fox News contributor, but certainly as mean-spirited. Mencken wrote extensively as a journalist, but also did a good deal of work analyzing the work of Nietzche. He was a very interesting fellow. The other problem with getting him on Fox is that he was the most strident voice against religion in our countries history. He was known, by his friends and enemies alike, as “The Anti-Christ of Baltimore.” I’m not sure the religious right would have liked him all that much and they still push some buttons up at Fox. I think his modern venue would probably have been talk radio.